Having just got back from the excellent operability.io conference and taken a lot of inspiration, especially from Andrew Shafer, Gareth Rushgrove, Matt Skelton, and Bridget Kromhout (links are to their slides), I felt compelled to write this. I’ve previously documented my journey to Platform Application enlightenment and even prosed a reference architecture for Platform Applications. I’ve also documented what I believe all self-respecting Platform Applications should do. However, I believe there is one critical aspect of any PaaS/PaaA system that needs a lot more attention and credit. 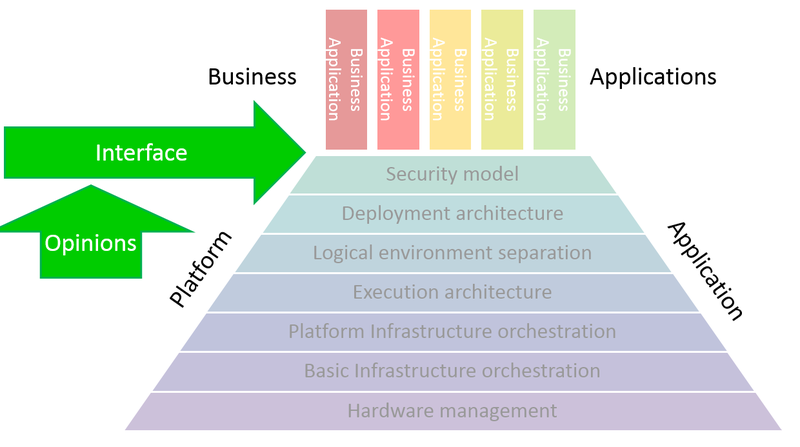 The rules of engagement between the Platform and the Business applications, also known as the opinions of the Platform. The old adage: “good boundaries create good neighbours” sums it up perfectly for me. * Obviously a dependency packaging container solution like Docker can help with this, but there is a lot more to a Platform Application that just being able to run something. A great example of Opinions is the 12 Factor App by Heroku. I’ve heard it come under some criticism as being a ploy to encourage people to write applications that will run on Heroku. I think that argument is laughable. I know it’s also come under some criticism that it’s opinions are wrong. To quote the Big Lebowski, “that’s just your opinion, man”. Taking it as a definitive set of commandments written in stone for all to follow is the wrong interpretation. These are the rules for Heroku. All of them are sensible. All of them are important to Heroku. Some are transferable. Some are not. Principles > Platform Opinions > Platform Implementations. 12 Factor App (or something equivalent e.g. the equivalent opinions from Cloud Foundry – are these so nicely documented?) may have principles you like. But equally some concrete opinions e.g. log to standard out you may not. I think Platform Opinions can also be thought of schemas. What about downsides of Platform Opinions? They could be inappropriate for the Business Applications, for example mandating that all state must be persisted in a database could be a good idea. But if an application that absolutely must store things to disk (e.g. Open LDAP) is needed, the opinion must be updated. But this really is just bad design. So I believe clearly defined, and optimised-for Platform Opinions are an unsung hero of the PaaS/PaaA prospect. In fact, I feel so strongly about this, I think it almost calls for Platform Opinions schema and even a Manifesto. I’m very surprised to find very little when searching Google for this. I’d like to see a books like “Patterns for Platform Opinions”, “How to write good Platform Opinions”. Is there anything like this out there, is anyone with me? This entry was posted in agile, aws, cloud, cloudfoundry, continuous deployment, devops and tagged 12factorapp, Agile, cloud, cloudfoundry, cloudnative, DevOps, docker, heroku, Iaas, operability, PaaS. Bookmark the permalink.